These exciting, challenging, and deeply touching true stories chronicle the lives of ordinary men and women whose trust in God accomplished extraordinary exploits for His kingdom and glory. Written specifically to challenge readers with the powerful lives of missionaries who have profoundly shaped history, these books answer today's call for positive role models and for opportunities to see how God works through the lives of those who follow him. The exciting life stories of these heroes will inspire the readers as they witness the drama of faith and character being tested under the most extreme circumstances. We're very pleased with the safe & quick arrival of this well-written set of Christian biographies. 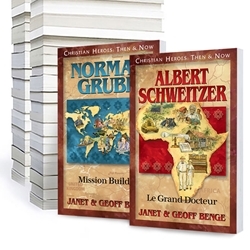 I'm so excited to add the full set of "Christian Heroes: Then & Now" to our Church Library. Yesterday I was captivated and deeply touched as I was drawn into the life story of Ida Scudder. I'm so excited to gift the full set to our church library for it's Youth Collection. We love the few books we have and are looking to buy the entire collection. My kids loved the books! We were able to open up dialogue about the Godly thing to do vs what man thinks we should do!